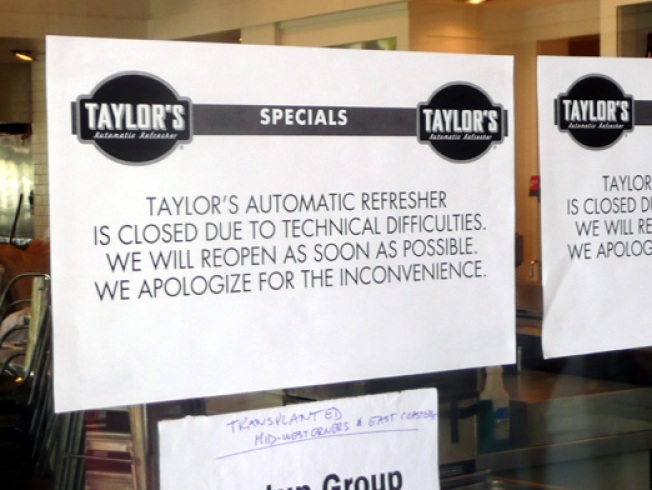 Ferry Building: Ok, we'll admit that filing this under "Disaster Report" is a bit of an exaggeration, seeing how Taylor's Refresher was back up and running by dinner service, but during primetime lunch service on the busiest Saturday in weeks—Farmers Market! Fleet Week! Fallfest!—water was streaming out of the kitchen, through to the dining room, on to the patio and finally, on to the Embarcadero. Burger aficionados were confused, employees were sweeping water, and as seen on the sign, dumbfounded Midwesterners were forced to change the meeting point to Pancho Villa instead.